Manchester City are waiting to discover if David Silva has suffered a broken bone in his cheekbone after being injured in the 2-0 win over West Ham. The midfielder, 29, was caught in the face by Cheikhou Kouyate's right elbow and appeared to be given oxygen before being taken off on a stretcher. 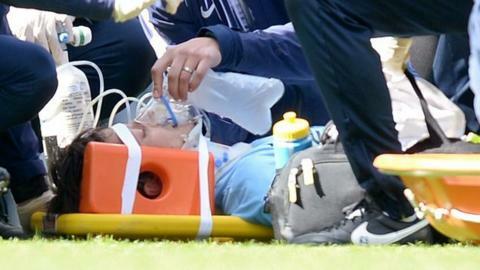 City boss Manuel Pellegrini said Silva was taken to hospital to discover the extent of the injury. "All the tests have gone well and I'm already home," Silva tweeted later. Pellegrini added: "The referee was very near the play so he decides what happens and gave a yellow card. "I hope that it was an accidental collision and not intentional because I don't think any player wants to cause that type of damage to another." City won courtesy of an own goal from James Collins and a Sergio Aguero strike and remain fourth and in the final qualification slot for next season's Champions League. They victory moved them seven points clear of fifth-placed Liverpool, who have a game in hand, and a point behind third-placed Manchester United. "It was important to win because we come from two defeats," said Pellegrini, whose side have won their last four home games but lost their last four away. "To lose the points we have recently is disappointing but we must continue working together because we have 15 more points to play for." Asked about his future, he added: "No comments about that."